I love my business credit cards. I've got 3, including a new one from Chase. Building my business's credit history is very important, but I also find the purchase protection very useful, as well as the way business cards make it easy for me to keep my personal and business spending completely separate. It's so easy to vilify credit card banks for some of the sneaky tactics they sometimes employ to generate revenue via fees and interest. However, I know from extensive experience that if you use credit wisely, avoid carrying a high balance, and pay your bills on time, every time, chances are you will have few if any complaints about your credit card bank. Moreover, I've been to many different parts of the world, and I've seen how difficult or expensive it is to get credit. I'm quite thankful for the easy credit that I enjoy as an American. For proof, all one has to do is step over our southern border and try to get a loan or credit card with a decent interest rate and fair terms. Good luck! "...U.S. Senator Charles E. Schumer (D-NY) today expressed alarm about a new tactic credit card issuers may be using to evade last year’s milestone credit card law, warning that card issuers are increasingly pushing consumers into signing up for corporate cards that are not subject to the law’s protections. In a letter to the Federal Reserve, Schumer pressed for a crackdown on this potentially abusive practice so that unsuspecting consumers are not lured by card offers intended to circumvent the law passed by Congress. 'Credit card companies seem to be purposely hawking corporate cards to consumers who don’t own a business and may even be retired. This is more than deceptive marketing; it is a dirty trick meant to get around the new credit card law. We need to put an immediate stop to this scheme, but in the meantime, consumers should be sure to read the fine print of the offers they are getting in the mail. This is the latest, most brazen attempt yet by the credit card industry to get around the law,' Schumer said. Last year’s credit card law, signed by President Obama, imposed a host of reforms on consumer credit cards, such as a ban on rate increases in the first year of a cardholder’s agreement and a requirement that the card issuer provide 45 days notice before a rate increase can be assessed in later years. But these reforms are not applicable to corporate, or professional, cards – which are intended for use by small business owners. Not coincidentally, credit card companies appear to now be marketing these corporate cards more widely, to ordinary consumers who don’t own a business and may even be retired. According to a market research group Synovate, mailings for corporate cards increased a whopping 256 percent in the first quarter of 2010. Average consumers are unwittingly signing up for the cards without realizing they are not covered by the stronger rules governing personal credit cards. In fact, the card companies appear to be playing to that confusion in the application materials for these corporate cards. A published report last week noted that an application form recently issued by one major card company no longer includes a section seeking detailed information about the potential cardholder’s business. Instead, the application merely requires a box to be checked indicating 'Yes, I am a business owner' or 'Yes, I am a business professional with business expenses.' This simplified application could easily prevent a card applicant from realizing the nature of the card they are signing up for..."
"...In response, Schumer proposed today in a letter to Federal Reserve Chairman Ben Bernanke that card companies be required to solicit and verify an applicant’s federal tax identification number before approving a corporate card application. 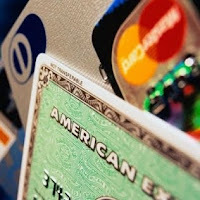 This way, Schumer said, the card companies would no longer be able to trick an ordinary consumer into signing up for a card that is not covered by the new credit card law..."
Here's what I propose: The Business Credit Card Accountability Responsibility and Disclosure Act of 2011. Why 2011? Because you know how long it takes for Congress to work things out. Here's another idea: have the Federal Reserve put new rules in place that restrict credit card banks from engaging in anything that is obviously unfair with regard to business credit cards. They have the power to do it. They did it with consumer credit cards earlier this year. Remember to read those terms and conditions carefully. If you signed up for a professional card thinking that you were signing up for a consumer card, just cancel the account. Lots of of credit card banks are very eager to get your business, so it's really no big deal, in my opinion. I wasn't born rich, and I need access to credit to run my business. I'm very happy to see plenty of competitive offers continue to stream into my snail-mail box. Credit is good. Competition is good. It's a great country.